A few days ago I had the pleasure to talk to Steve Maricle, one of the BC wildlife departments small lake biologists. 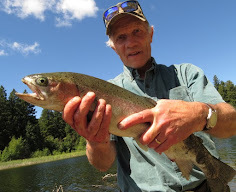 During our conversation Steve told me how happy he is that he finally could convince our provincial government to simplify the Freshwater Fishing Synopsis. Steve like many others, me included, always felt that the old regulations were too complicated with 37 different regulations for each small lake. More confusing then enlightening. Having traveled to quite a few places in North America to hunt and fish I always thought that the BC Fishing Synopsis, a magazine filling more then 100 pages, is without a doubt one of the most convoluted written regulations anywhere. Almost for each lake, river and stream there are different rules on fishing tackle, boat engine horsepower, retention limits among an array of other regulations. Thankfully Steve worked very hard to simplify the regulation and as a result we have much simpler regulations for 2009 that can be read without the assistance of a lawyer and do not need to be consulted each time one fishes a different lake. The biggest problem with the old regulations was that they would put off new fishers simply because they could not make heads and tail off it without reading the regulations for hours at a time. SL-2 trout and char daily quota is 1, plus on these lakes only single barbless hooks can be used, plus winter closures and fish size restrictions are in place where required. SL-3 trout and char daily quota is 2 plus bait ban and only single barbless hooks can be used. Winter closures if necessary. SL-4 trout and char catch and release only, plus bait ban and single barbless hooks only. Seasonal closures if necessary. Another new feature I like is that the ice fishing closures, previously dated, are now simplified with the remark. "If the ice is off you can fish". Before there was a date included but what if the ice was not off on that specific date. Where you still permitted to fish despite the ice fishing ban? The decision was left to the interpretation of the Conservation Officer. In the new regulation the ice fishing ban is lifted when the ice is off the lake at what ever date that might be. Much simpler and easier to understand and no interpretation need. There are many other positive changes and most of these changes are aimed at making fishing in British Columbia simpler and above all unify the regulation throughout the regions. I for one am very glad Steve invested all the hard work and time to simplify the regulation and had the necessary stamina to convince the bureaucrats in the government, which probably was the toughest part. Othmar; I'm glad you and steve were able to discuss the regulations and get things simplified. To many times the Game and Fish Commission put to many regulations on streams and reservoirs and each different type of fish in those fisheries that it all gets confusing to the fisherperson. What ever happen to "KISS" -- keep it simple stupid ?. Fish need protection too but there should be an easy regulation handbook to go by. Great article thanks.